6sqft’s series The Urban Lens invites photographers to share work exploring a theme or a place within New York City. In this installment, Katsu Naito shares his 1990s portraits from Harlem. Are you a photographer who’d like to see your work featured on The Urban Lens? Get in touch with us at [email protected]. In 1983, when Katsu Naito immigrated to America at the age of 18, he spoke barely any English. Growing up in Maebashi, a small city about 90 miles north of Tokyo, he had never heard of Harlem before moving to New York but was drawn to the energy of the neighborhood, quickly realizing he wanted to document it with his camera. 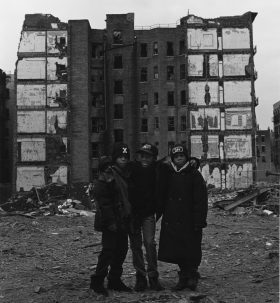 Now, more three decades since he first fell in love with Harlem, Naito’s photos of the ‘nabe’s residents in the early to mid-‘90ss are being published in a book and unintentional time capsule titled “Once in Harlem,” out now from TBW Books. 6sqft chatted with Naito about his journey and what makes Harlem so special to him, and he shared a collection of his amazing images.